Product Description, Claim and Disclaimer: Very pigmented and vibrant eye shadows with high quality ingredients, easy to match your look. Store in a cool and dry place and keep away from children. The eyeshadow is meant for normal skin only, stop using when skin allergic reaction occurs. Packaging: This eyeshadow comes in a cardboard box with necessary information on it. It has a fine packaging and a full mirror. It also has a brush for application. 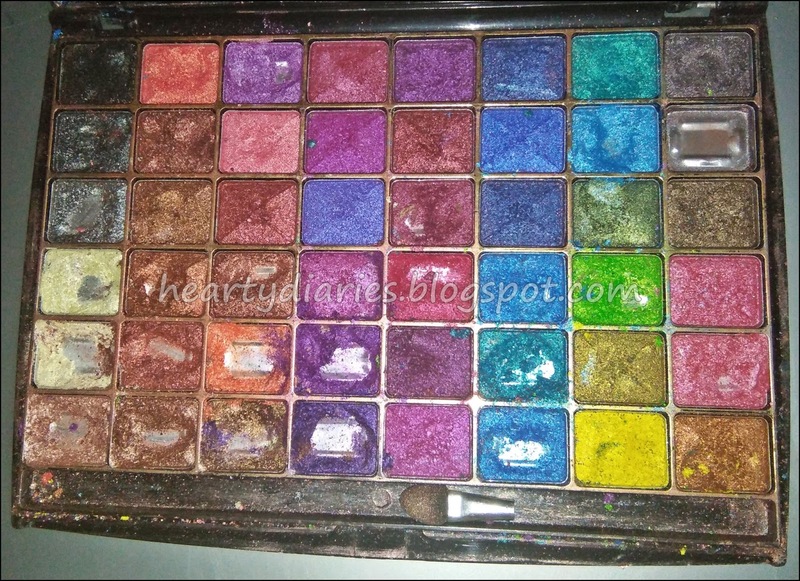 I am taking the picture from Google even though I have this palette in my vanity because it is in a bad condition. This was such a heart breaking moment for me. I forgot to keep it safely and my nephew destroyed it to play with these colours. WARNING: Keep it away from children or you will end up breaking your heart..
1. The eyeshadows are very very pigmented. 2. The formula is neither very powdery nor creamy. 3. The eyeshadow doesn’t spill over face while applying. 4. It has almost all colours and they’re metallic but don’t give a very glossy look. 5. The colours do not fade away or get light. 6. The palette is travel friendly and light weight. 7. It has a full sized mirror which is a very very handy thing while travelling. I can’t find any cons in this product so far. Will I buy it again? Is it affordable? Yes. For me, this eyeshadow palette is very affordable, as in this range, we get almost all colours with great pigmentation and good formula. This is so far the best multicolour eyeshadow palette I have used. I have been loving using this product and I recommend it to people who love eye makeup and playing with colours. Trust me, this one will not miss out any colour that you want. Please share this post and comment below. Do tell me if you want me to swatch this palette. Don’t forget to follow my blog and like my Facebook page!! wow..very honest review i love how you mention each and ever thing about the product..will definitely try this out..keep doing it..All the best?